Franck Thomas, who was awarded "Best European Sommelier" status in 2000, selected Domaine De Nizas' AOC Languedoc Rosé as his preferred rosé in a blind tasting. For a limited time only, Taltarni is offering our mailing list a sixpack of this award-winning French rosé from our sister winery Domaine De Nizas. Here are some recipes I created for the lovely fresh wine! Refreshingly crisp, with dry minerality, hints of berries, and a wonderful full mouth feel, this wine is ideal for a whole range of recipes. Here the fresh, aromatic tomato sauce is lifted by the wine, the rich salt of the chorizo bringing a roundness to the dish and adding depth to the clams. For a whole meal occasion, to compliment the Domaine De Nizas Rose, start with a bruschetta with fresh mozzarella and grilled zucchini, and finish with some fresh figs and sheep’s’ milk cheese. Cook the pasta according to directions on packet. Drain and set aside. Heat the olive oil in a large, heavy-base saucepan over medium-high heat. Add the shallots and chorizo and cook, stirring for 2-3 minutes or until crisp and golden. Transfer to a paper towel to drain. Add the tomatoes to the pan and cook for 2 minutes. Increase the heat to high, add the wine and bring to the boil. Add clams, cover pan and cook for 3-5 minutes or until clams have opened. Remove clams from the pan and continue to cook the liquid another 5-10 minutes or until reduced by half. Add the pasta to the pan with the clams and chorizo mixture and reheat. Serve into bowls, scatter with the parsley and enjoy with some crusty bread. Domaine De Nizas Rose is an ideal pairing for duck, it’s crisp character with a touch of mineral lifting the richness of the meat. The earthy flavors of the hazelnuts, salt of the olives and freshness of the vegetables bring out the subtle fruit of the wine, it’s palate cleansing brightness bringing the partnership of flavors together flawlessly. Serve it with a fresh baguette and some rich, peppery olive oil. Heat the oil in a non-stick pan over a medium heat. Add the duck breasts and sauté for 5-6 minutes each side or until cooked as desired. Remove from pan, cover with foil and allow to rest for 5-10 minutes. Place the beans, tomatoes, olives and hazelnuts in a bowl. Whisk together the dressing ingredients, season to taste and gently toss half through the bean mixture. To serve, slice the duck thickly. 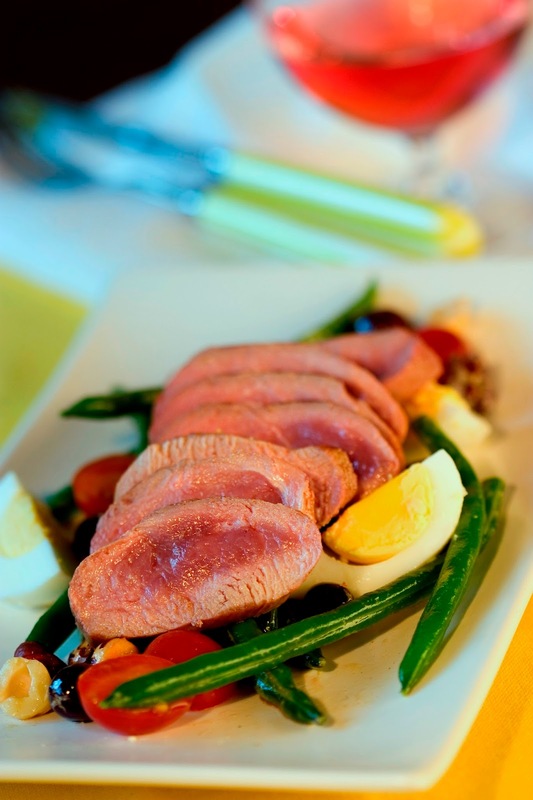 Arrange salad and eggs on plates or a platter, top with the duck and drizzle with the remaining dressing.